Facebook continues to resist calls for public disclosure of the Russia-linked ads that targeted American voters last year. 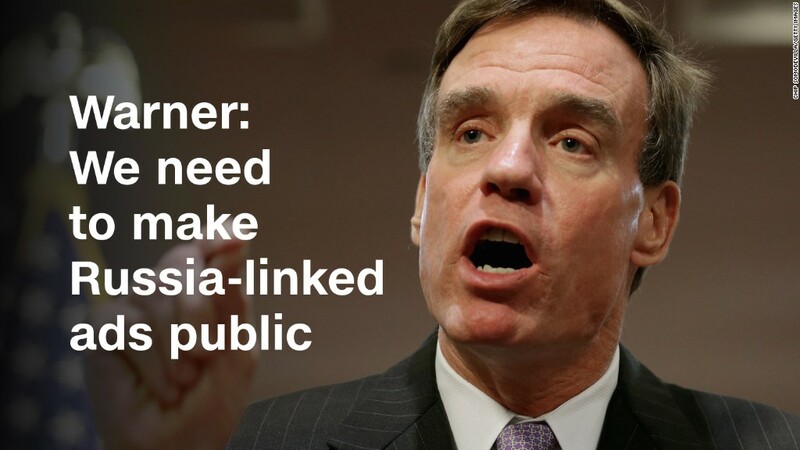 But Senator Mark Warner, the top Democrat on the Senate intelligence committee, is still pushing. "We want to try to find a way," he said, "to make some of those ads and other information public." Facebook provided data about the pro-Trump propaganda to special counsel Robert Mueller's team after Mueller obtained a search warrant earlier this month. At first Facebook declined to provide the data to Congressional investigators, but on Thursday the company reversed itself. "We've not received any of their information yet. They will disclose that to us next week," Warner said in an interview with CNN on Saturday. "We're going to try to work with them on how we can get that information then out to the public," he said. Speaking on CNN's "Reliable Sources," Warner said he wants both Facebook (FB) and Twitter (TWTR) executives to come in for a public hearing about the matter. Warner is working with fellow Democratic senator Amy Klobuchar to seek co-sponsors for a bill that would change that. "Every American wants to know that the political advertising they're seeing or viewing, whether it's on television or on their iPhone, that they know, one, it's not coming from a foreign nation or foreign agents, and two, they ought to be able to see the content, even if it's not directly focused on them," Warner said. He was referring to the idea of "dark posts" on Facebook and other web sites, when advertisers target specific audiences and hide the ads from everyone else. "If you're for or against a candidate, or for or against a cause, you ought to be able to see the content that's being launched against you, particularly if it comes from a foreign source," Warner said. Facebook said on Thursday that it will voluntarily implement disclosure features for "political" ads. There are big and unanswered questions about how Facebook will define political ads versus other kinds. Not content with voluntary action by Facebook, Warner wants legislation that will be enforceable and will apply to other web sites as well. Speaking the language of Silicon Valley, Warner said he views the legislation as "an iterative process." When pressed about whether Congress should seek to restrict, not just regulate, political ads on the web, Warner demurred, saying "I want to start with the lightest touch possible." So far Warner has no Republican co-sponsors, but he said he believes he'll get there. "In 2016, the Russians tried to help Mr. Trump. But the Russians are not pro-Republican or pro-Democrat," he said. "I strongly believe there will be an awful lot of Republican support" for the bill. In the interview, Warner did not limit his criticism to Facebook. In the run-up to election day, he admitted, there was not a full understanding of Russian attempts to meddle in the election. The intelligence community" did not "fully connect all the dots, unfortunately, until after the election," he said. Facebook, too, was slow to recognize it. "Ten months ago Facebook was saying, 'Hey, that's crazy, there was no Russian interference, there was no Russian involvement.' What we've seen now is that there was dramatic Russian involvement," Warner said, "both in terms of paid advertising, as well as these so-called fake accounts, and we still don't know the total number of fake accounts. I don't think we know the full extent of Russian advertising."